Once again I would like to start by thanking everyone for their support, including everyone who has pledged and shared the project. It has been a busy week in TheXLC HQ and a steep learning curve about running a Kickstarter! We never expected such a response in such a short time or the enthusiasm everyone had for our designs! We can confirm that all the designs are being re-worked as we speak to have removable windows and doors. Some of these are very simple but some are a little trickier! We have also been discussing what to do about the inside surfaces. Some are already printed on both sides so we will have a simple printed texture for the inside. For the ones that are only printed on the outside we will, at a minimum, colour them grey to roughly match the exterior. As we progress with this we will keep you updated. We have finalised the design for the gates and are please to present the final piece! 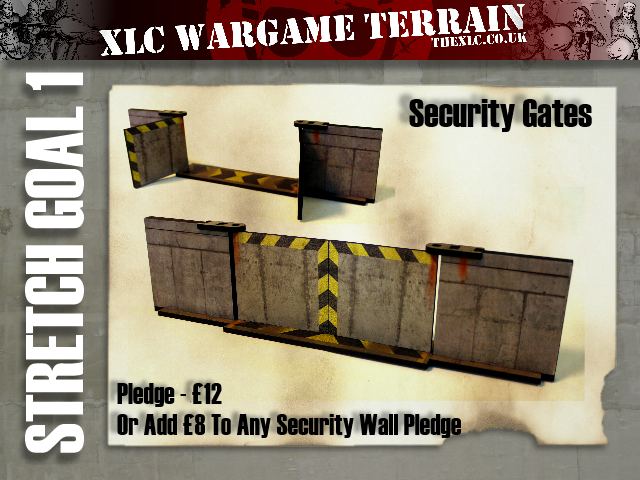 We will be adding this as a pledge on its own at £12, but if you have pledged for anything that includes the security walls pack we will include the gates for an extra £8. Just increase your pledge accordingly and we will request the pledge details at the end. At the time of writing we only have £809 to go to stretch goal 1! We are still looking for stretch goal 2 so keep the ideas coming! Stretch Goal 1 – £5000 – UNLOCKED!